After a good breakfast at the Lodge (oatmeal, bananas, raisins), I walked over to a nearby market and bought a a freshly-made tuna hoagie to go, plus a package of Kraft American cheese slices (something I normally would never eat). Ten minutes out of town I looked up to see a police officer standing on the shoulder of the road waiting for me. He had his hands on his hips and a smile on his face. I recognized Officer Minoggio (the partner of Officer Goins) from the previous day’s encounter. We greeted each other warmly and he told me he wanted to wish me the best of luck on my trip to the East Coast. “The police report we filed yesterday is on its way to Seligman,” he told me. “If anyone gets a report of someone walking on the highway, they’ll know it’s probably you.” He said the police have problems with drunks and homeless people wandering along the highways. But the report he filed indicates I have “sufficient means,” that I’m walking in honor of my father, and that I am pushing a professionally made kart. As we parted he added, “The eyes of Arizona are now watching over you.” I remember feeling that was probably a good thing. A few minutes later I was overtaken by Amanda and Troy on their bikes. We exchanged greetings and best wishes, and went our separate ways. After a few chilly morning hours the sun came out and I began to remove layers of clothing. I listened to Herbert von Karajan’s recording of Beethoven’s Third Symphony (I’d downloaded all nine when I was at the Motel 6 in Kingman). During the second movement, a crusty old guy in a Chevy 4X4 pickup pulled up. A brown Labrador was riding shotgun. “Where the hell you going?” he asked. His cap read, “Don’t Tread on Me,” and I couldn’t help but notice the large pistol in a leather holster sitting on his dashboard. (I didn’t notice any other icons sitting there.) He was friendly enough. The weather improved and the road continued, mostly flat but with a few hills just to keep me honest. 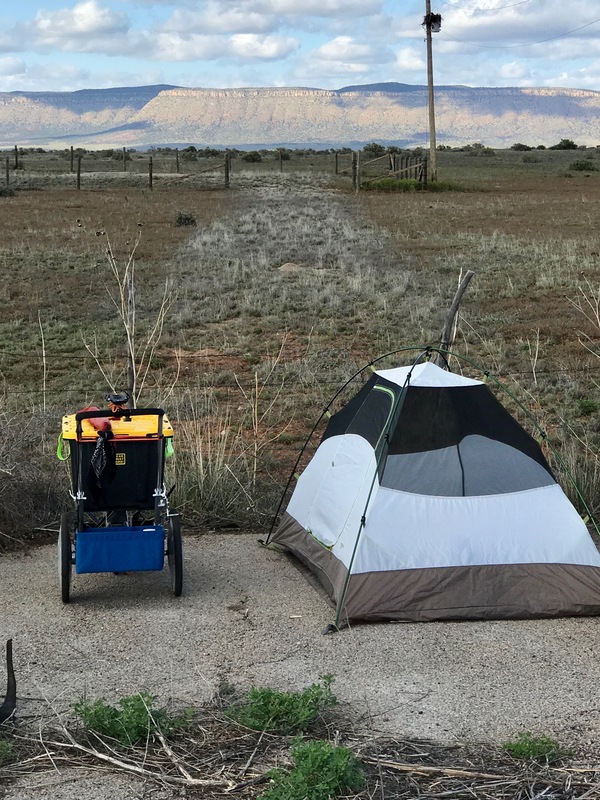 I met one other guy of note, Andy, riding an impressive bicycle and towing a small trailer loaded down with all kinds of gear and provisions. From our short conversation I diagnosed him as a misanthropic alarmist. He was convinced that I’d sooner or later be killed by a tornado, a cyclone, or baseball-sized hail stones. Perhaps I will be. Better than a heart attack on a golf course. Or Alzheimer’s.